On last night's show, Sun columnist Candice Malcolm joined me to discuss Justin Trudeau's comments at a recent townhall where he compared ISIS terrorists to legal immigrants. When Trudeau was asked about radical Islamists brining their hateful ideology to Canada, his platitude filled response compared terrorists to waves of previous immigrants to Canada. Trudeau invoked the Vietnamese boat people and Italians fleeing the destruction of World War Two to justify his open borders immigration policies. Perhaps he doesn't realize they were fleeing death and destruction, unlike the Jihadists seeking to bring it with them. WATCH my interview with Candice to see why these statements, from a Prime Minister who said returning ISIS members, could be "extraordinary voices our community", really aren't surprising. Liza Rosie…Thanks again. The acorn doesn’t fall far from the tree does it? Canadian Patriot, and they are calling who Nazis? Gerald Butts knows that Justin’s father was an anti-Semite. Everything they call us is what they are. Al, it simply is not possible for me to trust any Muslim unless they are an EX Muslim, a full on apostate. No amount of government intimidation can change that. According to the Koran, you are correct. Anyone who follows the tenants of that book is a warrior. Not all will want to chop your head off, but all have instruction to subjugate the unbeliever. Islam is a conquering ideology, its purpose is to conquer and conquer they will if we let them. If we don’t want Canada more than they want to take it, the will succeed. Not only is Justin going to tip the previously healthy demographic of Canada, but he is inviting the worst of the worst of Islam into our neighbourhoods. Warriors for Allah. Liza, all muslims consider themselves soldiers for allah. I enjoyed Candice’s interview on today’s Andrew Lawton show. Muta Ween, you know it! If they don’t like us suspecting a cover up, they should come clean. Their silence only makes suspicion grow. Its not like we are going to forget it. Canadians are supposed to be entitled to a quick trial. What the heck a happening with the Quebec city alleged shooter ? Is he getting sent to Gitmo or are they waiting for him to off himself in his cell? Of course there is a cover-up and massive intervention by the PMO. But sooner or later they have to proceed with a trial. Keep pushing Ezra , Trudeau loves you . 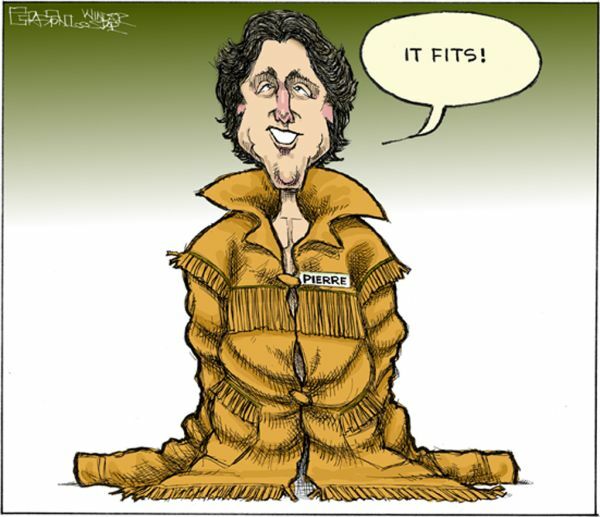 The Clown Prince Trudy seems hell bent on destroying Canada any way he can. He’s put my family and everyone else’s family in harms way with his stupidity and carelessness. I can tell you this; if one hair on any of my kid’s heads or grandkid’s heads is harmed he’s going to have to find a different planet to live on. Not only is Justin going to tip the previously healthy demographic of Canada, but he is inviting the worst of the worst of Islam into our neighbourhoods. Warriors for Allah. People who have done unspeakable things, and Justin thinks he can reform them? He either knows nothing about Islam or doesn’t care. Since 9/11 – IN THE NAME OF ISLAM (SATAN): 34,741 Attacks, 225,849 Killed, 305,584 Injured that we know of. Showing that he is an evil man as well as a stupid man. Justin may be a mere puppet, but somebody knows exactly what they are doing and it’s evil and Canadians stand around and watch it happen. They will not accept that we have been infiltrated and this is just another step in the take over. How can anyone continue to believe anything Justin says or does, and how anyone can have absolute trust in Islam considering the facts and current attacks and events is beyond reason. Give your heads a shake, get some synapses happening. Do it now.